Search is on for two men from Xinjiang and four cars with the license plates from the region. It could have been a suicide terrorist attack . Uyghur intellectual calls for more caution. AsiaNews sources: Not only the Uyghurs , but entire Chinese population is tired and dissatisfied with the leadership. Strong censorship on information. 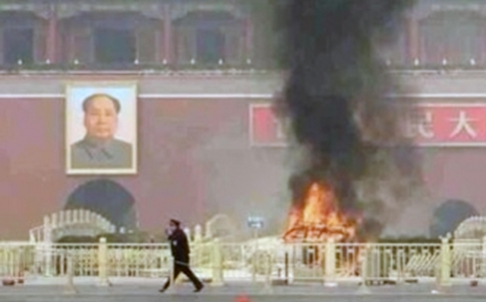 Beijing ( AsiaNews ) - Beijing police suspect that yesterday's incident - where a car drove into some tourists in Tiananmen Square , and then exploded , killing all passengers - was carried out by Uyghurs suicide terrorists. The incident occurred almost under the large portrait of Mao Zedong that dominates the front of the Imperial Palace , a few dozen meters from Zhongnanhai, home to many leaders. The incident took place yesterday at noon and in addition to the three people in the car (an SUV ) , killed a further two people, a Chinese man and a Filipino national, leaving 38 injured. Police and firefighters have cordoned off the area from public view. Today, the English edition of the Global Times, part of the People's Daily , said that the police have linked the incident with the Xinjiang and some Uyghur suspects . But the Chinese edition does not mention anything about Xinjiang . Yesterday, all day censors removed any news or comments about the incident from the web, allowing only the official version of Xinhua. Last night and today the police launched a manhunt to gather information on two Uyghur men and four cars with the Xinjiang license plate. Ilham Tohti , a Uyghur intellectual , writing on the website Uighurbiz.net , pleaded for caution because it is easy to blame the Uyghurs and increase control over the ethnic minority. The western region of Xinjiang has been shaken by Islamic Uyghur nationalist movements for decades. For the most part they seek greater autonomy from the cultural and commercial dictatorship of the central government that has colonized the region with millions of Han immigrants and hundreds of thousands of soldiers. The settlement also involves religion: Islam is strongly controlled in Uyghur schools, mosques, and society. In the past there have been incidents and clashes between Uyghurs and Han in Xinjiang, as well as attacks that the government in Beijing has branded as "terrorist" , though often conducted with makeshift equipment ( petrol bombs , knives , plastic , etc. ... ) . The Chinese edition of the Global Times today warns against "politicizing " the incident in Tiananmen too. Tiananmen Square, site of the infamous massacre on June 4, 1989 , is subject to a heavy security cordon to prevent even the slightest protest . In China, large-scale corruption d throughout the Party has led to over 180 thousand "mass incidents" a year, in which different groups - farmers, workers , retirees, ex-military , ... - Clashed with police , often violently. A source for AsiaNews in Beijing said: "The party is seeking to water down this incident, but it reveals the profound dissatisfaction and fatigue of the whole population , not only of the Uyghurs".